Tallahassee, FL—For the first time in North Florida; Tallahassee; Leon County’s history of television, a Death Penalty Trial was broadcasted live and video streamed live for the world to watch. After sitting in the Leon County Jail for nearly ten years, Mr. Henry Segura went on trial for the quadruple murder of his toddler son, his son’s mother, and her twin daughters. Mr. Segura, who was charged in 2012 by former Second Judicial Circuit State Attorney Willie Meggs, a Democrat, is facing the Death Penalty. Mr. Segura’s case was being prosecuted by Meggs’ top prosecutor (assistant state attorney) Jack Campbell, a Democrat, who is also the son of former Leon County Sheriff Larry Canmpbell, a Democrat. (Sheriff Campbell died in December 2015). Meggs served as 2nd Judicial Circuit State Attorney for thirty-two years. Willie Meggs and Larry Campbell were lifelong friends. While two of Meggs’ children worked under Sheriff Campbell as deputies, Jack Campbell (Sheriff Campbell’s only son) worked his entire sixteen year career as an attorney, working directly under Willie Meggs. To ensure Jack Campbell a successful career as an assistant state attorney (prosecutor), Willie Meggs assigned Jack Campbell criminal cases that were under the arresting/ investigative jurisdiction of his dad, Sheriff Larry Campbell. With Leon County’s Judicial System (Tallahassee) under the “Terroristic Rule” of the Campbell/ Meggs Klan (where Sheriff Larry Campbell booked them—Meggs charged them—Jack Campbell prosecuted them)—men, women, and children—many of Tallahassee’s citizens and visiting college students lived in fear—fearing local authorities. 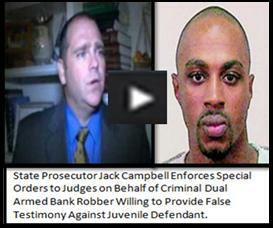 Some judges, some local attorneys, former 2nd Judicial Public Defender Lead Nancy Daniels, former Leon County Clerk of Courts Bob Inzer, District Two Medical Examiner’s Office, First District Office of Criminal Conflict and Civil Regional Counsel’s Office, and some law enforcement officials were all in place with their scripts to assist in “Spoon-feeding” sessions of Jack Campbell. During the first two weeks of August 2017, the world got to see just how desperate Jack Campbell lusts for death—to be right versus wrong. And all of the clowns formerly set in place by Willie Meggs for Jack Campbell were in place. There was Circuit Judge James C. Hankinson, Defense Death Penalty Lawyer Greg Cummings, local attorney Annabelle Dias, WCTV News Reporter Julie Montanaro, just to name a few. With Mr. Segura’s trial ending in a mistrial—only underscores the lingering “fear” that remains over Tallahassee’s citizens after being instructed for over 30 years to vote guilty or else… Take the jury on Mr. Segura’s trial, along with previous jurors on other criminal trials, and attach that with the attorney that was “in fear” under 2nd Judicial Circuit Judge Jackie Fulford—then there you have it. An attorney that is “in fear” of the very 2nd Judicial Circuit that he took an oath to represent—has paved the way to show that it is highly likely that jurors in Mr. Segura’s case, previous cases, and future cases are, were, and will be in fear of the same fear as long as the remnants of Sheriff Larry Campbell and Willie Meggs—Jack Campbell is in office.